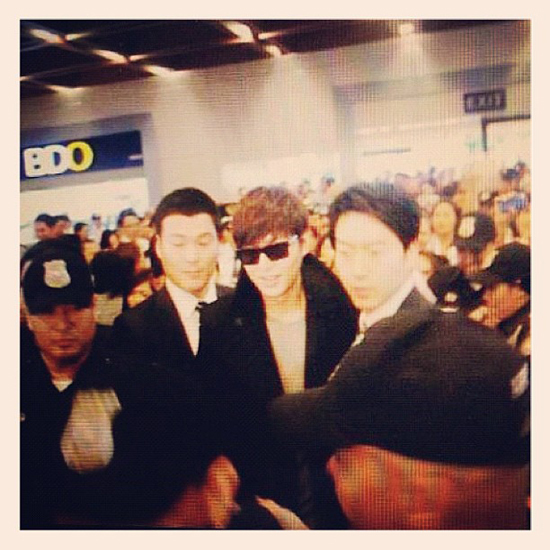 MANILA, Philippines - Korean actor Lee Min-ho arrived in the Philippines today for his scheduled fan meeting and mall tour this week. The superstar was met by his fans at the Ninoy Aquino International Airport Terminal 1 as he arrived past noon. He said that his flight was delayed. "Our flight got delayed just a little bit. See you in Manila soon," Lee Min-ho posted on Twitter. The star of the hit Korean drama "Boys Over Flowers" is the newest endorser of Philippine clothing brand BENCH. He will meet fans at the Benchsetter Fun Meet to be held on Nov. 16 at the Smart Araneta Coliseum. On Nov. 18, Lee Min-ho will hold his mall tour autograph signing event at the following venues: 3 p.m. at SM North EDSA Skydome, 5 p.m. at Glorietta New Activity Center, and 6 p.m. at the SM Mall of Asia Music Hall. "Boys Over Flowers" became Lee Min-ho's biggest break in his acting career as it made him famous. In 2010, he starred in the drama "Personal Taste" followed by "City Hunter" in 2011. He won the excellence award in the MBC Drama Awards 2010. He bagged the best actor and hallyu star awards for "City Hunter" in the Korea Drama Festival Awards in 2011. Lee Min-ho recently starred in his new Korean drama, "Faith," which finished airing at the end October.